Social Media in Real Estate goes hand-in-hand nowadays when you’re getting into this industry. New strategies for marketing and processes means that real estate is now more exciting and offers great opportunities for fast transactions, connections, growth and property sales than ever before! After all, it is said that 99 percent of all potential home buyers use the internet to research for properties. Facebook, Twitter, YouTube, Instagram and all other forms of top social media are now a part of every person’s daily activities. May it be used on studies, work, business or leisure, social media platforms are always present. And social media in real estate business is no exemption. It is said that Facebook is the king of all social media. With more than 2 billion users worldwide, it’s easy for anyone to set up an account and have their presence online. Facebook’s ad campaigns, which 69 percent of real estate agents report using consistently, has the ability to target posts and ads to your core demographics and target audience. Even when Facebook doesn’t deliver exact results, the analytics will help you understand what went wrong, and what should be done right the next time around. By engaging on more FB users posts, shares and other activities, Facebook’s role on real estate business is undoubtedly outstanding! Considered as the fastest-growing social media platform, Instagram has the ability to receive instant feedback on property and neighborhood photos. This is great for experimenting with different hashtags, captions or photography styles. In promoting listings on Instagram, realtors should remember that photos tell the story on this social media platform. As such, it is very important to post beautiful images on Instagram. The use of professional photography won’t hurt, but when DIY-ing, only use filters that make the subject look natural. Sharing 15-second video clips that showcase a house up for sale will also be a part of a winning strategy. Not so popular as Facebook and Instagram, Tweets will greatly boost a realtor’s exposure on social media. The more tweets a real estate agent sends out, the more leads can be generated. In addition to sharing listings, there are other types of content or pieces of information worth tweeting, like advice on moving as well as tips for staging and upgrading homes. And, of course, don’t forget your #Hashtags here. 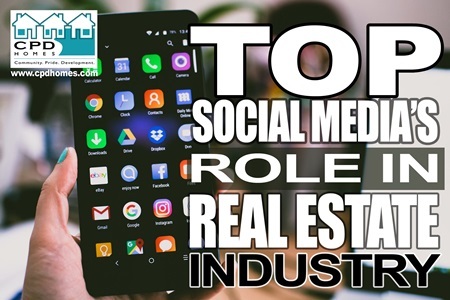 To summarize all these platforms, Social Media in Real Estate simply “Increased Connections” in the industry. It further established Customer Relationships and enhanced “Customer Service and Satisfaction.” It develops Lower Cost of Marketing that a company normally requires in setting-up real estate promotions. Being informed via social media in real estate is the key to a smooth and successful home sale or purchase. At CPD Homes, we want to arm you with the knowledge to make the best decisions and save you valuable time, money, and stress. A brief phone conversation with us may be life-changing. Whether you are looking to sell your home quickly here in the Northeast Ohio area or in the Tampa Bay, Florida area, purchase a home for you and your family to live in, or if you’re looking for an investment option, contact us at 216-282-4332 or send us an email at info@cpdhomes.com. Better yet, visit our website at http://www.cpdhomes.com or like our Facebook page at https://www.facebook.com/CPDRealtyHoldings/ .